The changing season has brought new challenges individually and collectively, but at the Sisterhood of Salaam Shalom, we are committed to Raising Our Voices and standing against hate. 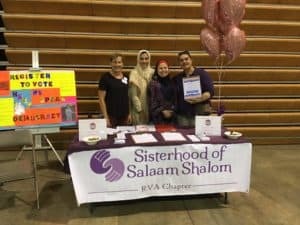 Whether it’s the many chapters that have organized voter registration drives, resounding enthusiasm for our upcoming conference, or the development of educational materials dedicated to spiritual activism, we are actively demonstrating that the Sisterhood is united in its commitment to celebrating diversity and community. Recently, we received further confirmation that the work we do matters on a larger scale. Earlier this year, Facebook launched a first-of-its kind global leadership initiative to train, support and fund Facebook Groups that are impacting the world for good. Out of over 6,000 applications, 115 participants from 46 countries were invited to participate as leadership fellows. We are thrilled to announce that Amanda Quraishi, an Advisory Board member for the Sisterhood of Salaam Shalom and lead administrator for our Facebook Group, has been chosen to represent the Sisterhood in this program! Amanda is one of only 30 North American participants selected and is honored to be sharing the incredible work of the Sisterhood in this prestigious international forum. 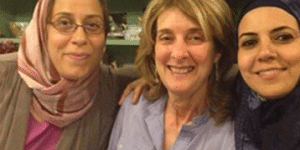 Stay tuned for exciting developments in how the Sisterhood of Salaam Shalom is using social media to build bridges! The sincere effort towards peace-building that is made by each and every member of the Sisterhood of Salaam Shalom is the most important reason why we will be able to benefit from this fellowship. Thank YOU for setting an example of what it looks like to stand against hate. Let’s continue to show the world what it looks like to build community through honest dialogue, peaceful engagement and the affirmation of our shared humanity. As always, we welcome your feedback and hope you will send individual and chapter updates to Samantha, our amazing Director of Chapter Expansion, at samantha@sosspeace.org. Register for Our Annual Conference Now! 2018 has seen a nearly-unprecedented surge in discrimination, alienation, and aggression. From the highest political leadership down to an individual level, we’re witnessing the movement of hate speech and hate groups into the mainstream, and now is the time to #Raiseyourvoice. 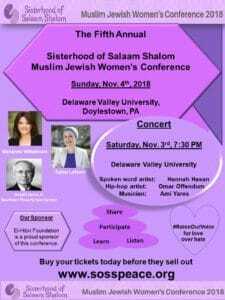 Our annual conference will take place on Sunday, November 4 from 9:30-4 at Delaware Valley University in Doylestown, Pennsylvania. Spend the day with top peace and social justice advocates learning, connecting, and building the skills necessary to advance peaceful Muslim-Jewish relations. Keynote speakers will include Marianne Williamson, the internationally acclaimed author; Edina Lecovic, a leading voice on America Muslims and an interfaith advocate; and Joseph Levin, Jr., co-founder of the Southern Poverty Law Center. Please register today to reserve your place. For those coming from out of town, we have reserved a block of rooms at the Hampton Inn in Doylestown, Pennsylvania. Take advantage of the group rate and make your reservation before the hotel sells out. We’re also excited to announce a full program of events on Saturday evening, including an interfaith Muslim concert, a dessert reception sponsored by local Pennsylvania and New Jersey chapters, and the opportunity to mingle with chapter members and supporters from around the country. Don’t miss out on this wonderful opportunity. Register today! Support our National Voter Registration Drive- Going on Now! This election season, voting is as critical as ever, and no one understands that more than the Sisterhood of Salaam Shalom. For that reason, chapters across the country are organizing voter registration drives to encourage first-time voters to participate in this important civic process. In August and September, co-leaders joined a national committee to learn the ins and outs of putting on a successful voter registration campaign, and from now through November, chapters are hitting the streets and helping college students, new citizens, senior citizens, and others have access to casting their votes come election day. We’ve recently released a new series of educational videos and accompanying written materials focused on the need for and how to’s of spiritual activism. Do you feel compelled to use your skills and energy to make a difference in your community but aren’t sure where to start? Do you ever feel overwhelmed in the face of need? 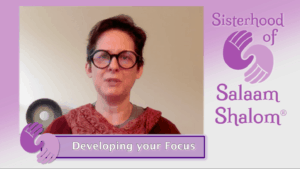 These videos outline the twelve key components of spiritual activism and a plan for how to turn your compassion into action. Please feel free to utilize these materials to reflect on the reasons for activism, agenda setting, putting a plan into action, garnering feedback, and more. These resources, produced by Janet Penn, Director of Training and Resource Development, are as central to the work of the Sisterhood as they may be to work you do elsewhere in your communities.